Fisher Paints has got you covered when it comes to interior paints that are high-quality, durable and beautiful! 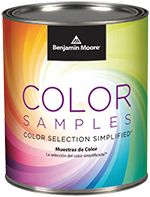 Need a custom mix or a perfect match to a color sample? No problem. Our knowledgeable and courteous paint experts will create the exact custom mix you desire. And, we have the most up-to-date computerized technology for crafting the perfect color match. 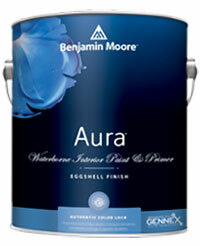 Aura Interior delivers the ultimate performance for brilliant, rich and everlasting color. A trusted brand for more than 50 years, formulated for easy cleaning in a wide variety of sheens. 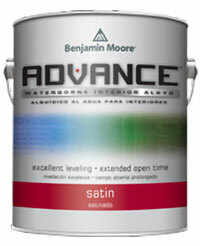 A premium quality, waterborne alkyd paint offering durable high-end finishes ideal for doors, trim and cabinetry. 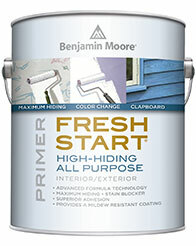 Benjamin Moore’s highest-performing 100% acrylic primer. Delivers maximum hide & uniform finish. 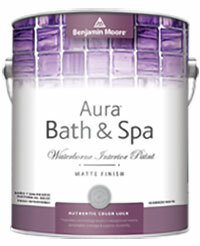 The primer of choice when significant color changes are required. 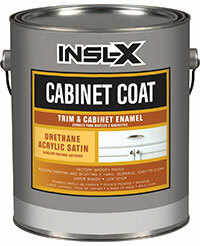 The ultimate factory-like finish for refurbishing kitchen & bathroom cabinets, shelving, furniture, trim & more. 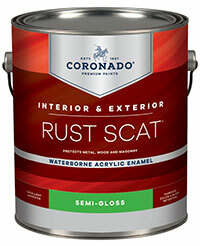 A waterborne, acrylic enamel designed to produce a rugged, durable finish with good abrasion resistance. 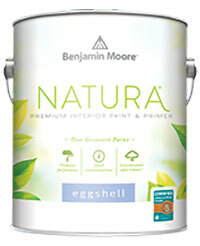 For use on indoor & outdoor floors & patios. 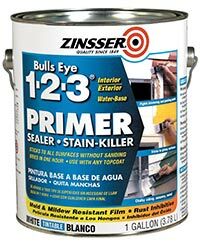 A multipurpose, water-based primer/sealer for outstanding everyday stain blocking on a variety of surfaces. 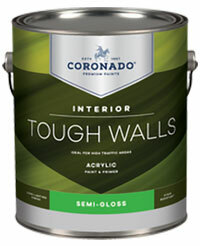 Adheres to interior & exterior surfaces. 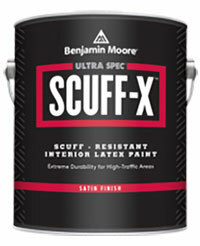 Can be top-coated with latex or oil-based coatings. 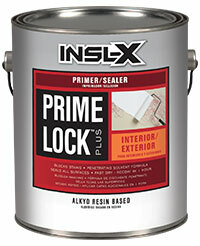 A fast-drying alkyd resin coating that primes & seals plaster, wood, drywall, painted or varnished surfaces. 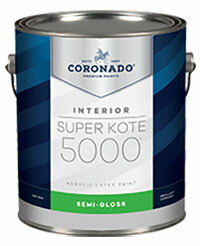 Ensures paint topcoat has consistent sheen & appearance. 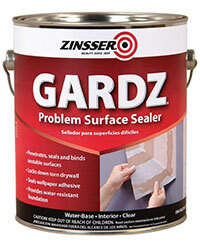 Seals stains from water stains, smoke damage, etc. A premium-quality, acrylic-urethane primer-sealer with unparalleled adhesion to the most challenging surfaces, including glossy tile, PVC, vinyl, plastic, glass, fiberglass, galvanized metals & more. 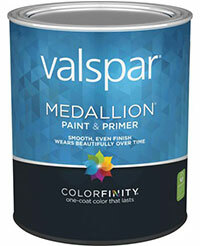 Designed for commercial projects—when getting the job done quickly is a priority—this premium-quality, vinyl-acrylic formula delivers dependable quality & productivity. 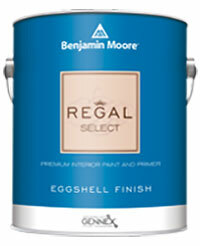 Engineered to deliver exceptional stain resistance & washability. 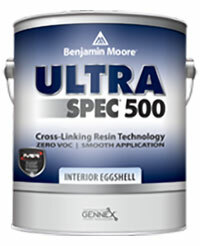 Ideal choice for high-traffic areas, it dries to a smooth, long-lasting finish. 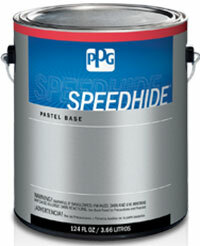 An acrylic enamel suitable engineered for metal surfaces. 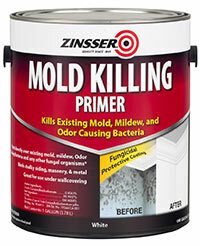 It also adheres to primed masonry, drywall & wood. Provides excellent color & gloss retention. Blocks stains from water, fingerprints, smoke & crayon. 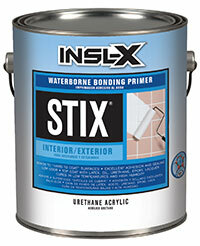 Formulated from a 100% acrylic resin, it provides an excellent foundation for both latex & oil-based paints. A super premium latex developed to resist household stains, providing durability for use in high humidity & high traffic areas. PPG’s best professional interior/exterior latex formulated to meet the performance requirements of professional applicators. 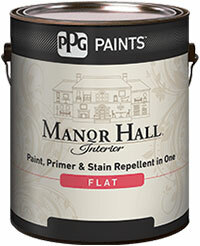 Ideal for interior trim, kitchens, hallways, general use. A low-odor, zero VOC latex paint designed to meet performance requirements of institutional, commercial & residential markets. Ideal for use in motels, nursing homes, homes, schools, retail space, office buildings, hospitals, etc. A versatile, ultra-durable water-borne acrylic formulated to bond very difficult surfaces: fiberglass, ceramic tile, laminate & many plastics. 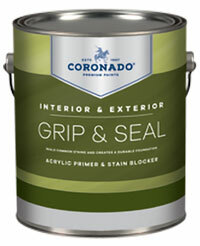 Ideal for cabinets, doors, windows, shelving, fixtures, trim & concrete floors. 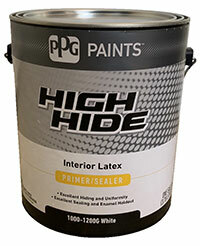 A high-quality interior latex primer & sealer with excellent hide, good sealing & enamel holdout qualities. 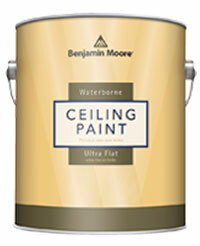 Ideal for use on drywall, skim coated drywall, acoustic ceiling tiles, popcorn ceiling, concrete block. 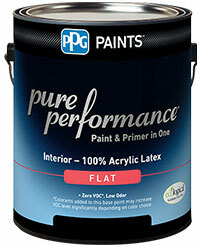 PPG’s premium professional interior/exterior acrylic universal primer, formulated to meet residential and commercial performance requirements. 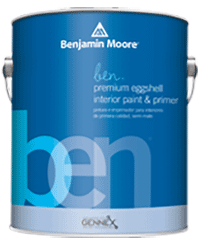 Formulated for the professional, a latex paint delivering premium quality, high-hiding finish designed for interior walls, doors, and trim. 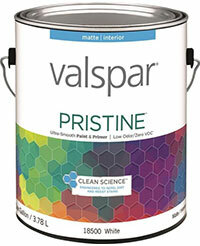 A durable paint & primer in one that protects with a 100% acrylic coating for a lifetime of interior beauty. 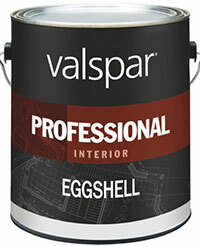 A paint & primer in one specifically engineered to repel dirt &resist stains, offering luxurious color, single-coat coverage. 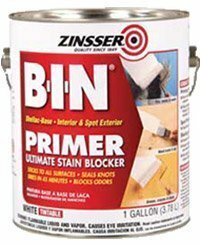 Zinsser’s most popular primer. 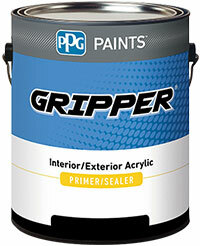 A premium, whole-house primer-sealer providing outstanding performance with a low-odor, flexible, acrylic formula. A whole-house, oil-base primer-sealer that delivers ultimate hiding power. 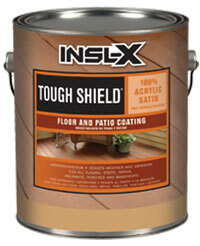 Blocks stains, hides dark colors, prevents tannin bleed, penetrates & seals exterior wood. A fungicidal protective coating that can painted over existing mold, mildew, moss, fungi, odor-causing bacteria and any other fungal organisms. It prevents growth of those organisms. 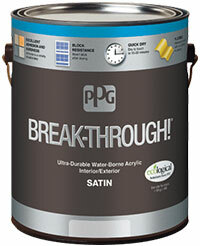 A water-base formula that locks down porous & crumbling surfaces. Dries to a clear, matte finish, creating a hard, paintable seal over damaged drywall, adhesive residues & other chalky surfaces. A “silver bullet” primer that covers everything unwanted. 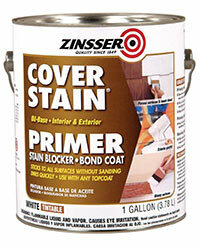 The original, shellac-base primer-sealer is outstanding in permanently blocking stains, odors & wood knots.